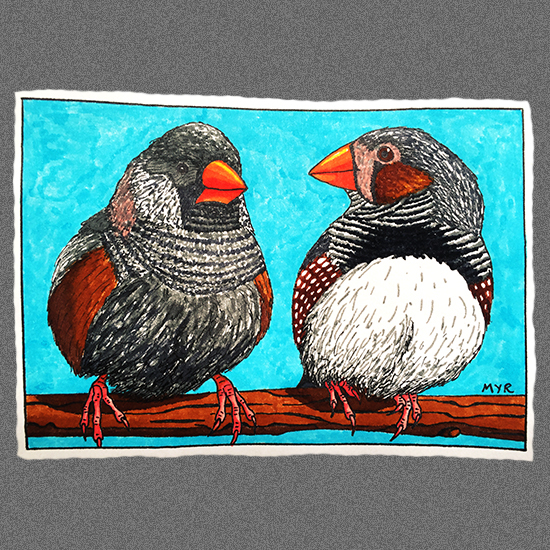 This pen and ink and Crayola markers drawing of two zebra finches happened because I asked myself – what percentage of human DNA resembles bird DNA? And why did I ask that question? Because April 25th was National DNA Day, a #doodlewashaday hosted by Charlie O’Shields, and #SelfieArt Day, which is hosted by Teresa Robeson. Charlie and Teresa are both sweet, fun, funny, creative and talented illustrators. And in case you were hoping for a more traditional selfie, here is one I drew 20 years ago from my reflection in a window while doing math homework one night. Here is an article which may interest you. Thanks for answering my question Shannon :-)!!! So interesting that we share 50% of our DNA with a plant. Thanks for the article link – it looks interesting at a glance… will give it a thorough read tonight. And I’m so glad you like the birds and selfie. Thanks for your kind words and cute birdy emoticon, Catherine :-)! Thanks for your lovely comments Susan :-). Hopefully I’ll get around to drawing a more recent selfie next month. I always enjoy seeing yours and those of the other selfiearters. I love that we share the DNA with birds. Your birds are brilliant! 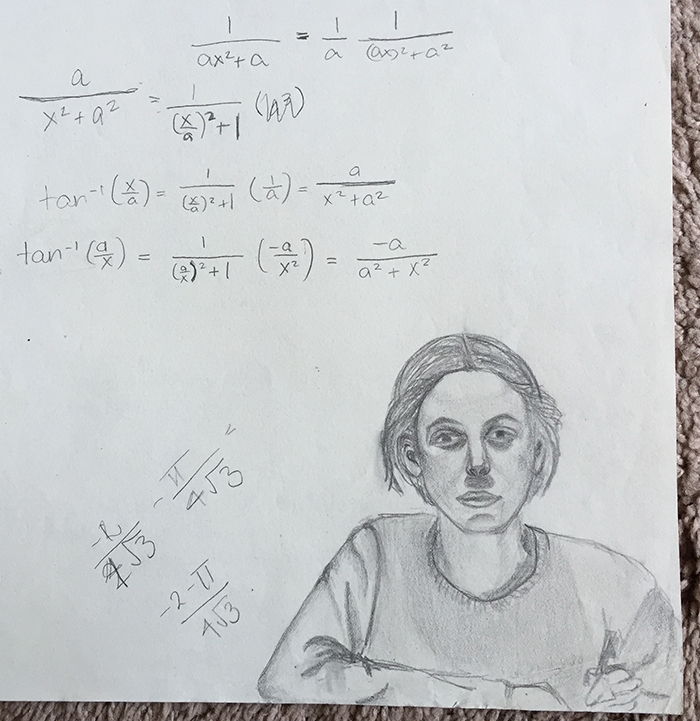 And a very lovely math portrait. Thanks for your kind words Sharon :-)! DNA day was kind of fun. I learned a few things I didn’t know before. What amazing birds you did! And your selfie is so reflective and powerful! Thanks for sharing Myr! Thanks so much for your encouragement Jodi :-)! Thanks for your lovely compliments Charlie :-)! And thanks for getting people involved in celebrating national and international days this month. I had fun with DNA day. Learned a few things! And got to see some awesome self-portraits. If you squint and tilt your head to the left a bit, the finches look almost exactly like us ;-). Oh wow these are beautiful! Your eye and skill for putting down the details on paper is amazing. I’ve never seen these type of finch, but sure would like to. Your traditional self-portrait is good too. I think it’s great that you kept that! Thank you so much for appreciating the little finches, Deborah :-)! I saw a bunch of zebra finches in the Bloedel Conservatory in Vancouver. I think they reproduce quite easily in captivity. I’m not usually super keen on animals in captivity, but I think the Bloedel Conservatory is a very, very beautiful enclosure and the wee birds sound pretty cheerful. Maybe there is a similar conservatory near where you live? My old self-portrait is the only one I’ve ever done from a reflection. I like that it looks like me and also captures that moment in time. I picked up a flower painting book by Billy Showell at the library and I watched some of her Youtube videos. The details and painting techniques seem a bit daunting but I guess I just have to give them a go, step by step. I’m amazed by the beautiful veins and folds in her petals and leaves! Thanks for the recommendation. MP! She does amazing work, but so do you! Thanks Deborah :-)! I’m going to try for a pretty painted hummingbird. The art store near my house didn’t have 140 lb hot press paper, so I’m going to try 110 lb smooth pen and ink paper and see how it goes. Otherwise, I’ve got a pad of 140 lb cold press. Have you tried drawing/painting one of your hummingbird photos yet? I’ll start working on mine this weekend. It is almost May!!! Oh how exciting! I know your Hummingbird will be beautiful! I tried drawing the body once but it was a mess. I’ve been thinking about trying again these last few days because we are so close to May, and it’s a busy month for me. I’m ramping up for a week in NYC just after my and my daughter’s birthdays which are within a week of each other in May. The 8th Draw-a-Bird day is just before that! I need to get busy! I’m looking forward to reading your thoughts on the 110lb smooth pen and ink paper. Oo, sounds like you have some fun birthday times ahead :-)! And how lovely that you can share them with your daughter. I haven’t painted yet! Maybe I will start with simple shapes and swirls tonight. I did try my new pen and ink paper with pen and ink. I like the smoothness for the pen lines but the eraser bits are a little difficult to brush off when I erase my pencil lines. Do you use a grid to draw your birds? Or a ruler? I saw my first ever savannah sparrows today, in the scrubby field where I saw the coyote couple a while ago. So many of them singing! How awesome to see Savannah Sparrows! Did you have your camera? Oh yes, I think each paper has it’s own learning curve too! I need to dig my grid out. I haven’t used the ruler I’ve been trying to use guide lines to and from the horizon. I’d probably do better with the grid! Oh, yes. I took a whole bunch of photos. And some a few days later. They liked to be far away though and the sun really shines on a wide-open, hay-coloured field. Hopefully, I’ll find a few gems. I always draw with a grid for computer images and a ruler for book images. Otherwise, I just can’t eyeball the relative distances between things! I used my pencil as a ruler a couple of nights ago to paint a the Hummingbird. I had much better success! Thank you for reminding of those tried and true rules! I’m going to post my 4th attempt on the 8th. Number 4 was a charm! It turned out great :-). That is so sweet that you are ready to go back to your romantic pre-marriage days after 35 years. Glad your husband is slowly coming around to the idea of pre-marriage romance too. Hopefully my husband and I will still share friendship and romance in 35 years. Lol :-D! Well, I suppose old works want a little viewing time now and then. And I like seeing the variety of works you created in the past. What happened to all the time you had to draw back then? I guess you are writing more now? Thanks for your lovely compliments on my arty stuff and I’m so glad you are also a fan of bird facts! By the way, you inspired me to watch a few documentaries with David Attenborough. Currently watching Life. It is a bit brutal! But also beautiful. And thanks for being cool with my bird selfie. It motivated me to participate. Though some day I will draw my current self… eventually. The ospreys are back in Calgary! I call all the female ones Teresa :-). I’m so glad you’re watching David Attenborough’s documentaries! He is the best. I can’t stand most documentaries because they all seem so schmarmy and sensationalistic (not to mention dumbed down) compared to his. Hmm, I think the squirrel who visits our balcony is a Wilma. She has very obvious teats :-D! She and the cat sometimes stare at each other through the window. Love your finches, they are stunning. Absolutely adore the saturated color and the delicious detail..especially their feet…awesome…and the question posed was a delightful platform for their presentation. For a brief moment I thought the birds represented your selfie via DNA…but your drawing was wonderful…treasures like that from the past, are like looking in a time capsule, fantastic and talented. Thank you for sharing. Thanks so much for your kind words, Haunani :-)! You were right, the birds are my selfie via DNA! I was trying to get out of drawing myself. I got rid of most of the drawings I did a long time ago (I move a lot) but I kept a few because it is nice to have a few mementos. Sums! Heehee :-D! Thanks your super compliment, Jill! Great illustrations, Myriam! Having mathematical formulas with an artistic sketch is very cool (and unusual). Thanks M.R. :-). Well, it was my math homework scrap paper but I got distracted by my reflection in the window. I was outside of the city so the window curtains were open and the night was pitch black outside. Thanks :-)! I’m glad you liked the pairing. Hmm… I think a lot of human thought is abstract (conceptual) and most people, at least those with “intellectual” interests, “see” certain types of abstractions more clearly than others. I liked calculus a lot back then, but haven’t used it in ages. Your use of a variety of mediums for the bird sketch turned out striking, sharp and full of color; I have to smile at your selfie; you look about as interested in your math homework as I would “not”. Thanks for your lovely compliment, Lois :-). I’m glad my selfie made you smile about memories of doing math homework… for different reasons than it made me smile about doing math homework.